The ruins of the Al-Quds hospital in Eastern Aleppo had that special smell you can find in places where disasters have happened. It was a mixture of charred, wet wood, of rot and rubble and concrete dust. The corridors were cold. It was January 2017 and outside winter was in charge of the wilderness of broken, empty buildings left by weeks of shelling and air strikes by the Syrian military and its Russian allies. The armed opposition groups that had controlled Eastern Aleppo had been blasted until they capitulated. It was a major victory for the regime, the biggest sign up to that point in the war that the Russian intervention at the end of 2015 had set President Bashar al-Assad on the road to victory. Earlier in 2015, I had asked President Assad if Syrian forces had used barrel bombs, chemical weapons and other indiscriminate weapons against their own people. He denied it, saying they targeted only “terrorists” and were fighting not to kill Syrians, but to save them. Whenever I have spent time with Syrian forces during many visits throughout eight years of war, I have asked the fighting men what they think of the accusation that the Syrian army has killed more of its fellow citizens than any other group. They always deny it, and express their horror at even the suggestion that it might happen. Thousands of casualties were treated at Al-Quds hospital during the siege. Medical debris was everywhere. Surgical instruments were ready to use on a table in the operating theatre – they had left in a hurry after shells hit the building. Big cracks zigzagged up the walls and across the ceilings. 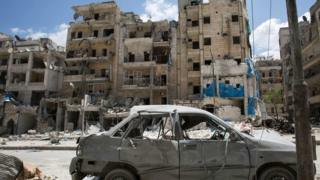 The district around the hospital was badly damaged and piles of rubble blocked the streets. Only a handful of people had hung on in an area where thousands once lived. Hospitals and civilian buildings are protected under international humanitarian law so it was clear, immediately, that there were big questions to answer about whether war crimes had been perpetrated. Video taken during the siege shows casualties – wounded, dying and dead children, as well as men of fighting age – being rushed into Al-Quds and the other medical facilities in Eastern Aleppo. The scenes have been repeated many times across Syria since 2011. Wars are less chaotic than they appear. Pain and death are inflicted on someone’s orders. And wars have laws – some are supposed to protect civilians. In Syria, they have mostly been ignored. Hamza al-Khatib, one of the doctors at Al-Quds hospital, says he witnessed war crimes every day that killed and maimed civilians. He escaped to Turkey and on to London after Eastern Aleppo fell. Two years on he says he wants justice, to see the perpetrators in court. The cost of Syria’s war is immense. A country destroyed, perhaps half a million dead, and overwhelming evidence of war crimes by all sides, according to UN investigators. The rebel side, a changing mass of alliances and coalitions of armed groups that at times have fought each other as much as the regime, have used indiscriminate weapons against civilians areas. On what was the regime-held side in Aleppo I saw shells made from gas cylinders, as well as the casualties they caused. But even at their strongest, rebels never had the firepower to inflict as many casualties as the regime. The ruins are part of the evidence. 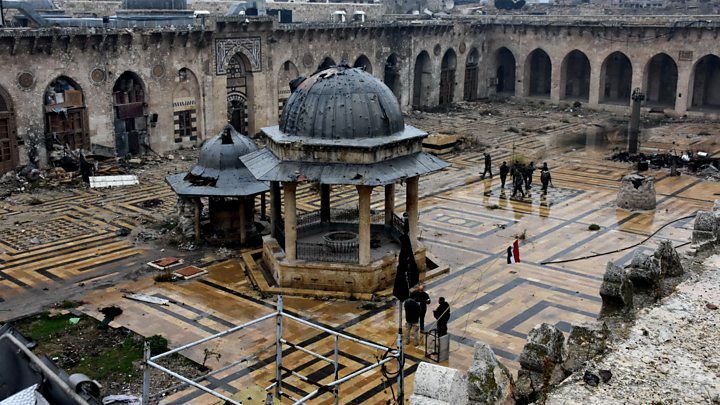 The regime started winning big after the Russians intervened in 2015 – taking the destruction to a new level, with enough firepower to pound the big rebel enclaves until they surrendered. Many civilians died. I went right through East Aleppo just after it fell two years ago and it was hard to find a building that was not damaged or flattened. Many civilians died – and wanton destruction is a war crime too. All the countries that have intervened in Syria’s multi-layered war have questions to answer. Raqqa was once the beating heart of the jihadist group, Islamic State. The Americans, helped by the British, levelled it. Amnesty International, the human rights group, condemned them for not acknowledging how many civilians they had killed. Rebels, now mainly jihadist extremists, continue their fight out of Idlib province, their last significant piece of territory. But President Assad’s side has almost won the war. Investigators from the UN as well as national governments have spent years collecting evidence of war crimes. But turning evidence into prosecutions is difficult. Syria’s wounds might have a chance to heal if war criminals face the law. But the victor’s justice tends to apply when the fighting stops – so it looks as if the regime and its allies, for now at least, will be safe.